Book of Mormon Central has been publishing terrific material since January 1, 2016. It was time for the group to produce an event. 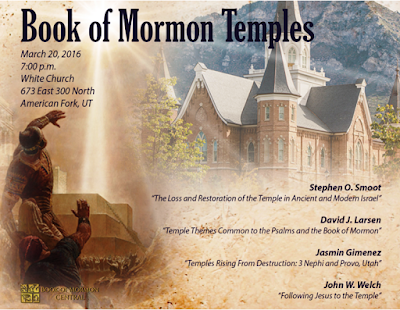 To celebrate the dedication of the Provo City Center Temple, Book of Mormon Central in collaboration with the American Fork 29th Ward hosted "Book of Mormon Temples," a fireside at 7 pm on Sunday, March 20, 2016. Approximately 175 people attended. As with all images on this blog, click to enlarge. Pres. Keith Blake of the American Fork Utah East Stake Presidency presided. Taylor Halverson conducted. Taylor holds PhD's in biblical studies and instructional technology from Indiana University. He teaches adult Sunday school in the Hobble Creek 15th Ward, Springville Utah Hobble Creek Stake. He is on the BYU faculty and serves on the Book of Mormon Central Executive Committee. Quin Barney offered the invocation. Quin is 1st Counselor in the Elder's Quorum Presidency in the American Fork 29th Ward. He teaches Seminary at Brighton High School and is a Book of Mormon Central Associate. Nicole Shepard talked about the first international Book of Mormon Day on March 26th, 2016. Book of Mormon Day is a joint project of More Good Foundation and Book of Mormon Central. Nicole teaches Sunday school and is a Visiting Teaching Supervisor in the South Jordan YSA 3rd Ward, Riverton Utah YSA Stake. She is an editor, script writer, and layout artist with Book of Mormon Central. Stephen Smoot is a newly set apart ordinance worker in the Provo City Center Temple. He enters the University of Toronto in the fall to pursue an advanced degree in Egyptology. He is a researcher and writer with Book of Mormon Central. You can see his presentation here. David Larsen is 1st Counselor in the Spring Creek 4th Ward, Springville Utah Spring Creek South Stake. He has a PhD in biblical studies from University of St. Andrews (Scotland). He is a researcher and writer with Book of Mormon Central. His presentation is here. Primary children from the American Fork 29th Ward sang "I Love to See the Temple" directed by Steve Pratt and accompanied by Erik Anderson. Steve is Primary chorister in the American Fork 29th Ward. He teaches 6th Grade at Westfield Elementary School. Eric is one of the Primary pianists in the American Fork 29th Ward. He is a student in horn performance at Utah Valley University. Jasmin Gimenez is a member of the compassionate service committee and assistant pianist in the Provo YSA 91st Ward, Provo Utah YSA 7th Stake. Her degree is from BYU in web design and Near Eastern studies. She is a web designer and content manager with Book of Mormon Central. Her presentation is here. Jack Welch is a sealer in the Provo Temple. He read at Oxford and received his JD from Duke. Jack is on the BYU law faculty and is Editor-in-Chief of BYU Studies. He founded FARMS and chairs Book of Mormon Central. His keynote presentation is here. Blaine Dickerson offered the benediction. He is a ward missionary in the American Fork 29th Ward. Blaine is one of the skilled craftsmen (wood worker and welder) who built both the Ogden and Provo City Center Temples. The fireside included a display of about 20 important books on the Book of Mormon, classic titles that have stood the test of time and been broadly influential. It also featured a small gallery of recent Book of Mormon artwork from Joseph Brickey and Glery Becerra. Article updated March 25, 2016.